So this 2A model has a Mighty Motor!!! Well, I have tested the devise but I'm sorry to report that it is not THAT impressive. Judging from the fender extensions and the four headlights it has to be the Sebring version. Despite rather strange chassis colour (the side view even looks like a 2C this way), bandit driver and the artists' fight with the front screen and radiator hot air exit, still a charming picture. Note circuit impression in the back ground and the car touching a pylon. Prototipo 2F hurling down a fast corner (at Monza I presume because it's an Italian model and it features starting number 1). Italians love red and maybe they have tried to add a touch of Ferrari with the 'chassis line' and wing coloured this way. The artist made the windows too big, the white strip in the side mounted radiator inlet is missing, the wing stacks are too short, there is a lot wrong with this drawing. But the atmosphere is great and catching in my view. 2F in BOAC 500 trim. Great box! Every square inch, on every flap, is used for information. 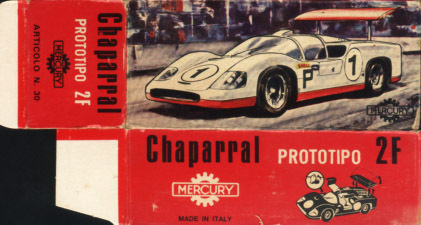 Portrait of Phil Hill, Chaparral logo, other model cars from the series, etc. It's a pity I can't read Japanese! Art work is of Michael Turner quality. Very good job. One minor thing: the wing is hidden beneath the name. That's 70's! 2F in a box liveried in flower power style. Jute, psychedelic decorations.. You would think it's a box for a Jimmy Hendrix puppet. The dark oval in the upper part forms a showcase when folded the right way. That's the only good thing. But nevertheless a peculiar and beloved item this one! A lot of buyers of this kit must have been convinced to have purchased a 2C because the box said so. WRONG! It's a 2A with flipper tail. On the box of this Japanese kit are some other mistakes: Group 7 racing didn't exist in 2A days and what the hell is RACEING SPORTS? I have build this kit a very long time ago and the form characteristics and proportions are not too good either. So altogether a bit disappointing this one. And why does this art work ring a bell??? See the photograph below, taken from the book of Falconer/Nye.. Find the differences. Good luck! Some weird art work from Politoys brochures. The 2F is presented with the wing in a VERY strange position! 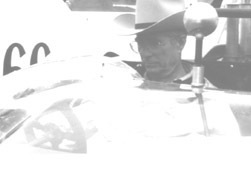 This could not have been Jim Hall's idea of aerodynamics. I have painted the lower part of the doors of the actual model white by myself. The colour of the 2J is definitely wrong but Jackie Stewart seems to be the driver. Rather accurate indeed. The doors are proudly presented in opened position but in reality it worked completely different. Despite the wrong colour the form of the 2J in the illustration is okay but the actual model lacks all kind of reality finesse. 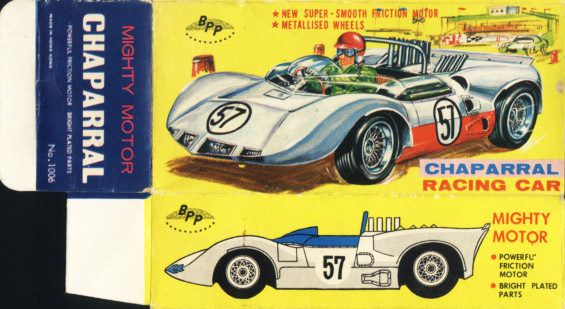 Cox decals on Chaparrals can be seen on many Sixties racing pictures. 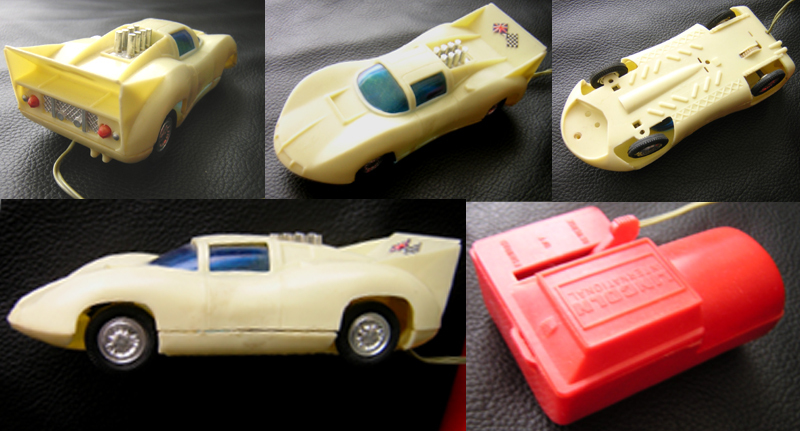 Cox was a manufacturer of model racing cars. They were one of the first visible sponsors of the team. 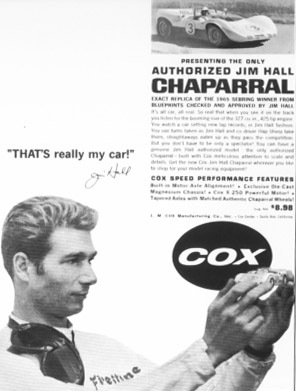 Here's an ad from Cox with Jim Hall proclaiming that "It's really my car!" So, Chaparral and model racing is a natural combination. A lot of products have been made during the years. And even today, many new model Chaparrals are on the market. Let's have a look at my varied collection. 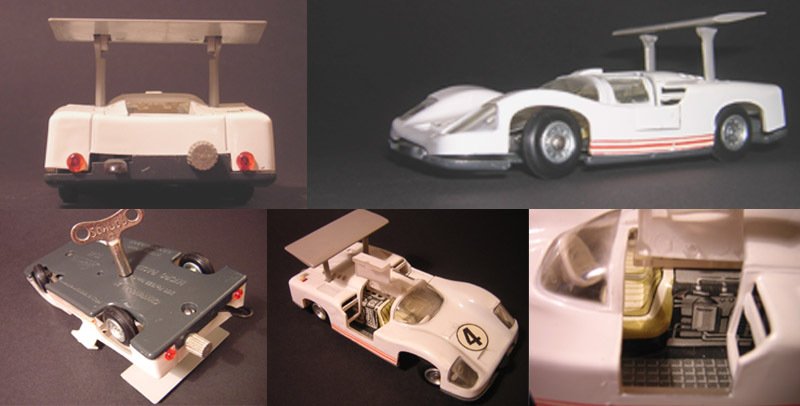 The SCX car is a remake of the original Scalextric model of some 35 years ago. As a kid I didn't have the money to buy one. So a few years ago I took the opportunity to put this one on the shelf. The engine is of a different type but all the rest is a faithful copy of the old one. I suspect that the manufacturer, then as now, couldn't decide if the model they created was an 2E or a 2G. I can't either! So they simply called it GT, which it is definitely not! Scale 1:32. The Märklin model is, unmistakably, a 2E . Even the blue wing (from the early races) is there. Somebody rescued it from his parents' attic and thought it more appropriate the Chaparral should be at my place. He was right. The scale seems to be just a little bit smaller than a regular 1:32. The Jouef 2F is still smaller. I think the scale is 1:64 or something like that. It is rather accurate however, despite the red colour. I don't know anymore how it came into my possession. The same goes for the 2D Carrera. It's a rather bad model so I think I must have gotten it for free. I changed the Carrera guiding system so it could run on my Fleischmann track. Scale 1:32. And now for the beautiful stuff. MRRC is a manufacturer of fine slotrace cars. I think they use moulds from classic Revell and Cox models. Both models are very, very nice although the modern fashion of equipping slotrace cars with strong magnetos is not my favourite. When the tires are new, the roadholding is OK but soon the grip gets worse. For me it makes little difference because I usually don't race with these cars. The little HO scale 2K, I bought it at a model train fair last October. It misses the right front wing. That's why it was cheap I suppose. When I'm retired I'll fix it. Like 'pensionado' Troy Rogers did with the real Chaparrals. On the right hand side of the grid are the 1:24 scale cars. The 2D Stabo car is the only complete and original one. A rather bad model with wrong dimensions and a very strange front screen. The chassis however is a beautiful, typical Sixties, aluminum one. Tires are much beyond expiring date! The Testors also has a nice Sixties aluminum chassis. The body was a 'see through' 2G from another manufacturer. I painted it but Jim Hall inside, still waits for the wing to be fitted. The longest pitstop in history. I will be busy when I'm retired because the 2C body (manufacturer unknown) has to be fixed on a, yet to obtain, chassis as well. Same goes for the 2D 'see through'. All these bodies are, rare, original Sixties stuff. 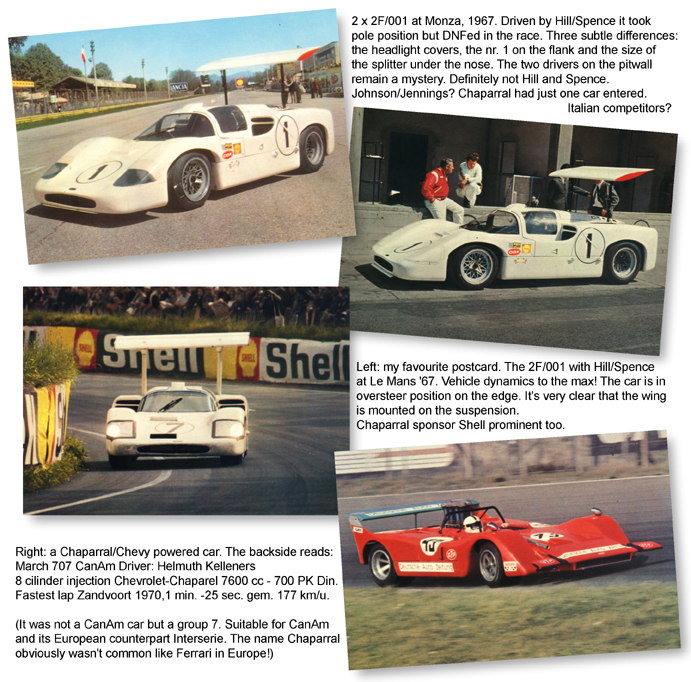 The last one is the first Chaparral. I'm rather fond of it because it's the only 1 I have. I bought it as a very basic vacuum formed kit in a simple plastic wrap. And I know the exact time and place: Goodwood Festival of Speed 1997. 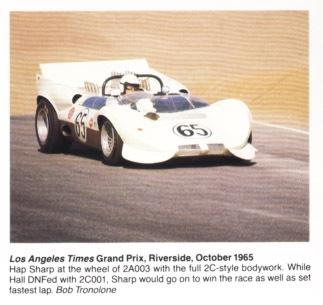 Richard Falconer, the Briton who restored and owns a Chaparral 1, brought the real car and the kits to the event. The chassis is home made (like the true backyard specials of the period), the basic forms are already there but it still needs a lot of work. I think I need retirement tomorrow. So, altogether a weird collection of slotrace cars. The people in the back seem to have fun anyhow. A few pictures of this slot car on my home track. Scalextric has done a very good job. The model is superb, really beautiful with accurate details. It's all there: the Lexan front spoiler, missing headlights, the wheels, roll cage, decals, Jim Hall inside, exhausts, mirror, etc. etc. And what's more: it goes like hell. With the magnets out you can nicely define the degree of drift trough the corners. Delicious! Trans- Am revival in 1:32! In front of the Camaro is the Scalextric 2F. When power is on, it has lights so you can imitate Le Mans. Behind the pit wall are some Revell/MRRC models and the, not yet ready, Chaparral 1 kit I bought from Richard Falconer. Chaparral Camaro racing history. 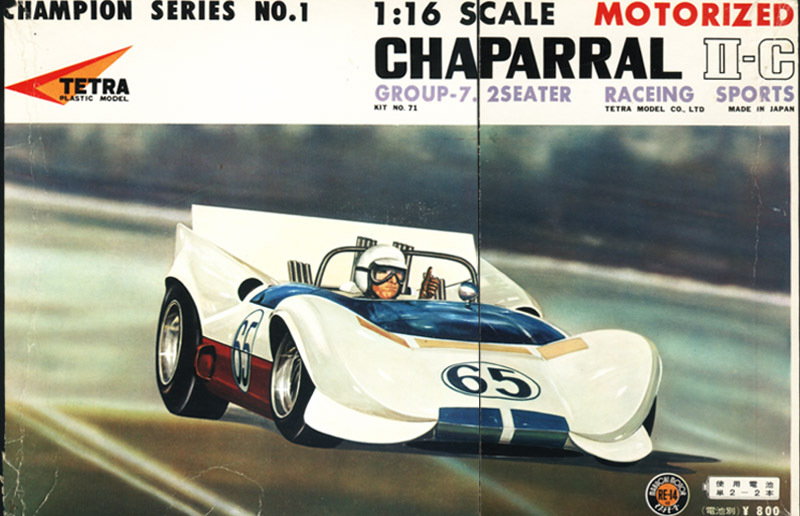 Another very peculiar Chaparral, this model from Lincoln International (what a name for such a shame!). It has a real chassis number: no 1024, and Made in Hong Kong signing. A slot race comrade brought it from a business trip about ten years ago. I forgot the country and I can't ask anymore because he sadly passed away shortly after. I remember being very disappointed with it because this guy wanted me to pay what he had paid (about 10 dollars) for the worst model I'd ever seen. I couldn't refuse however because he would be disappointed in return so.. well, it ended up in my collection and I'm still amazed about this monstrosity. Here it is in full glory. The nearly 5 inches is definitely meant as a 2D. The shape of the windows, the nose with the lights. We can even tell it's the Daytona version by the spoiler (here it's not moveable but it was in the race), the very little hump on top of the left rear fender (oil cooler) and the exposed carburettor stacks. On the flip side are bulky proportions, strange sloping rear fenders, four (!) exhaust pipes, very clumsy tires, it's a complete disaster! The underside reveals some surprising details. It seems like the mould has been used also for a kind of slot race car! Hence the small hole in the sunken front part that's maybe meant as space for a guide flag? And it seems that in another life the chassis could have been equipped with some kind of steering with ball joints, whereas my version has a very solid front axle with fixed wobbling wheels that will only go in a straight line. And then there is the wire. It connects the Chap to the red power pack. It has room for one battery that should propel the car forward or rearward by a ratchet. I tested it once, years ago, but the thing wouldn't barely move. Should I dump it? I'll keep it. In memory of the slot race comrade. 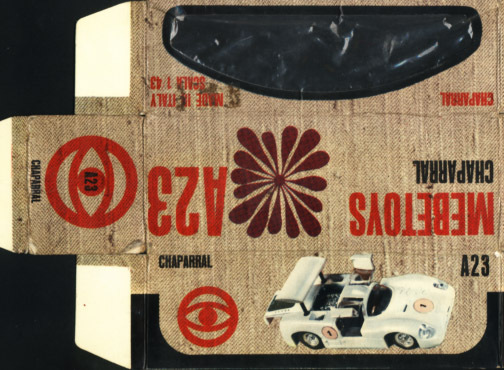 One of the most peculiar Chaparral model cars of my collection is this small 2A. It's brandless, the only identification is Hong Kong. I discovered it by coincidence. In the Eighties, a colleague of mine had tacked it to his key ring, hence the hole in the front lid. I immediately recognized it as a 2A despite the wrong colour. The characteristic design elements of the original car are incorporated just good enough to identify this thing as a 2A: the four headlight fairings, the V-shaped front and screen pattern, the engine lay-out and the simple tail with just two lights, the fuel filler covers, the scoops in front of the rear wheels, it's all there. I told my colleague that I was interested in his little piece of scrap and he proposed an exchange deal. I happened to posses a similar kind of one-mould-bottomless-one-colour-two-axles-four-wheels-windowless model car. It looked like a Seventies American gas guzzler. Because of the model's bright yellow paint job the deal was easily done, a new hole was drilled and the American coupe began a new career. I sometimes considered to restore this 2A to some extend but finally decided to leave it as it was. Including the dirt on the tires and all it is a most charming model. I suspect it must be at least 40 years old. 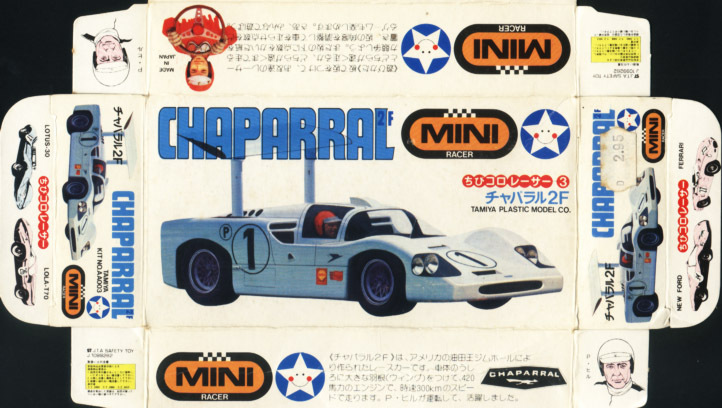 Another weird Chaparral model. A car with the most bad finishing ever seen: crooked tin plate chassis, plastic body crooked too, chinks where you don't want them, doors that don't fit and literally fall apart. But.. it features a wind up engine and a solid adjustable front axle. Thus equipped it can complete nearly two rounds with a 1 meter radius! And look at that cosy interior: a printed tin plate engine cover and seats. And talking about the seats; look at their forward position and king seize steering wheel. It resembles the luxurious interior of a classic motor yacht! I like this model. The one in front is the 'Yellow Submarine' Chaparral 2K. It won the Indy 500 in 1980. It's a beautifully detailed 1:43 model of Marsh Models. I ordered it as a finished product from G.P Mobilia in England. It must have been some 20 years ago. It was expensive at 67,50 Pounds. When it arrived the front suspension was severely damaged, due to postal transport troubles I suppose. A call to the seller meant that I could have the model repaired by a modeller in my neighbourhood at their costs, a most generous offer. I'm glad I bought the finished model because I think the application of the delicate pin striping alone would have given me nightmares. The model in the back is the Hall/VDS Pennzoil Lola, driven by John Andretti, see Racing Other Brands. It is an Onyx release. It was rather cheap but nevertheless it's a satisfying model. 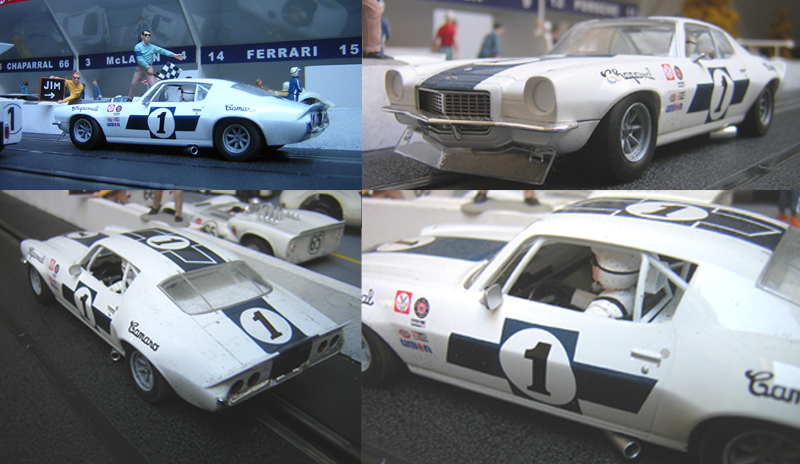 Well, here's another fabulous 1:43 Marsh Model's model: the big one in front. It was pictured in British magazine 'Autosport' (June 5, 1986), and I initially thought it was a photo of the real car. As it turned out it wasn't. I ordered this one as a finished model too. Until then, the best 2D available was the French Solido (the second big one pictured). Compared with the MM 2D it shows a lot of inaccuracies but nevertheless it's still a nice mass product. The yellowish small 2D is a French Champion model. It's very basic and the lines resemble the bigger Solido. The second small 2D (third from the left in the upper part) is a rather recently released Hot Wheels car. I suspect they have used the MM model as an example because it's really like a miniature brother version.